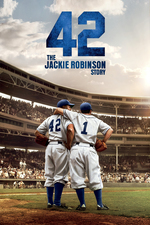 The story of Jackie Robinson, from his signing with the Brooklyn Dodgers organization in 1945 to his historic 1947 rookie season when he broke the color barrier in Major League Baseball. Come for: the real life story of one of the most important moments in baseball history. Stay for: Harrison Ford in an age appropriate role. Ford was superb in this film. And Mr. Boseman was too. As a Louisville native, the Pee Wee Reese treatment was more than I could have hoped for. I'm unsure how much of the details were actually hyper accurate, but I greatly enjoyed the film. AFAIK, the only thing that wasn't accurate was Robinson having a breakdown in the dugout and breaking the bat. But, the director said, such a thing could have happened somewhere else, at some other time, given all the abuse he was taking. Pee Wee putting his arm around Robinson in Cincinnati is accurate, according to Pee Wee's Wikipedia page. Love this movie. It's inspired me to watch the Ken Burns Baseball series.